The silver box is set on four ball feet. 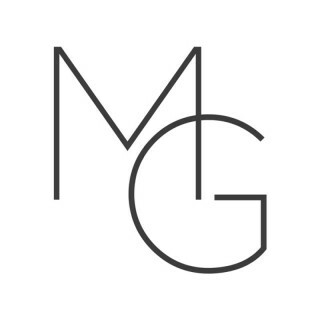 Its body is of rectangular form, with curved edges, and it is covered by a shaped lid with a flat top. 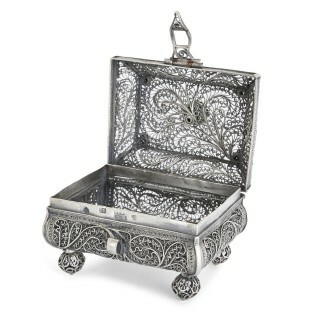 The lid is shut by a decorative clasp. Its top corners are decorated with small flower finials, and its centre surmounted by a flower finial. 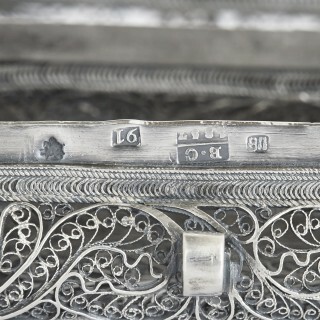 The silver box is fully hallmarked. 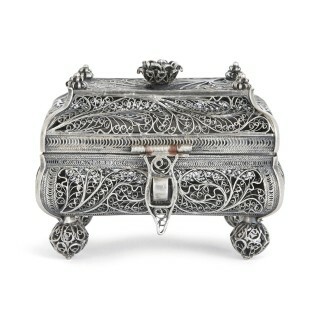 This exquisite silver box is designed to hold the aromatic Besamim (spices), which are passed around the synagogue during a Havdalah ceremony. It is thought the beautiful aromas of the Besamim box comforts and soothes the congregation, at the end of a restful Sabbath (seventh day) and start of the working week. 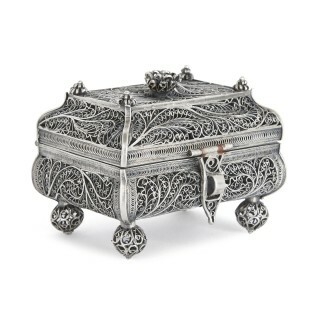 Employing a method known as filigree, the craftsman has created the box by curling, twisting and plaiting silver wires, soldering them together to form delicate openwork patterns. The pierced surfaces created will allow the beautiful scent of the Besamim spices to escape. The organic, foliate decoration may be interpreted as a playful reference to the box’s function, as a container for natural spices, herbs and fruits.